Soft, creamy, and full of intense mango flavor, this homemade mango ice cream is a celebration of summers and mangoes! Made with juicy Alphonso mangoes, you’ve never had a more delicious mango ice cream made at home! The ice cream is made from scratch with just 3 ingredients. No cooking, no churning required. Just fold the condensed milk and mango pulp with whipped cream and freeze! 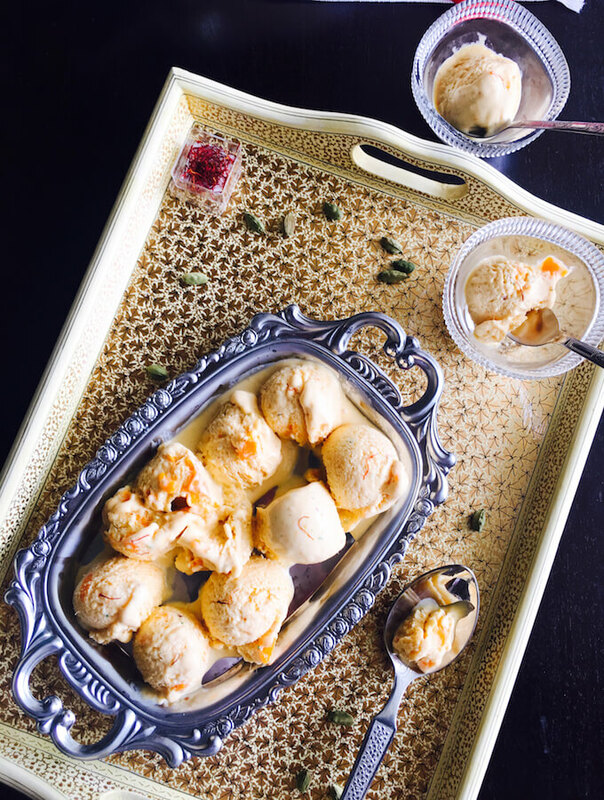 A favorite amongst all, this homemade mango ice cream is full of real mangoes. I added both mango pulp and tiny chopped mango pieces. No store-bought mango ice cream can come close to it in its intense mango flavor. And it is perfectly scoop-able like the store-bought ice creams without using any chemicals or preservatives. A lot of ice creams on the market contain a chemical called GMS or CMC to make it creamier. The base of this simple 3-step ice cream recipe is whipped cream folded into condensed milk. The creaminess of the ice cream comes from condensed milk and whipped cream aerates the mixture which prevents icy bits. You can add any flavor to this base. Maybe some cocoa powder and choco chips or some strawberries, or coffee, or salted caramel! The mixing bowl is your playground! This is my last batch of mango ice cream for this season. The rains have now started and the mangoes will soon start to lose their sweetness. Though I am stowing away some mango pulp in the freezer too for recipes like mango and chia seeds pudding or the light and fluffy mango soufflé. I can never have enough mangoes and having some mango pulp in the freezer means I can always whip up these delicious desserts! What is your favorite mango recipe? 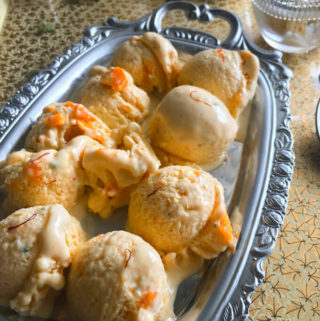 This no-churn mango ice cream recipe is super easy and delicious. With just 3 ingredients, it is soft and creamy with an intense mango flavour. You can use the same ice cream base to make different flavours. Peel and chop the mangoes. Puree two mangoes to a thick pulp and cut one into very small pieces. In a mixing bowl combine together condensed milk and mango pulp until well mixed (you can use a blender too). Once combined add the chopped mango pieces (and any other additional flavour you may want, like cardamom powder or vanilla extract). Beat the whipping cream until fluffy and stiff. Fold in lightly the condensed milk and mango mixture, until well combined. That’s it! Pour into a freezer container. Put a sheet of cling wrap on top, cover, and freeze for at least 8-10 hours. To serve, take the ice cream out of the freezer 5 mins before serving. 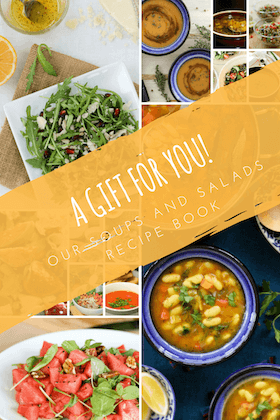 Open, remove the cling wrap, scoop and serve! Choose the juiciest and most ripe mangoes for the recipe. To give it an Indian touch, add 1 tsp of green cardamom powder, a pinch of saffron, and/or a few chopped pistachios. « 4 ingredients Chikoo ice cream!